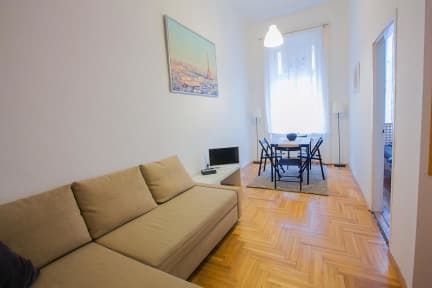 Friends Hostel & Apartments i Budapest, Ungarn: Bestill nå! 15-44 days before arrival: 50 % of the total costs is to be paid as a cancellation fee. 4-15 days before arrival: 75 % of the total costs is to be paid as a cancellation fee. 0-3 days before arrival: total costs of the group booking is to be paid. 20% of the originally booked number of rooms can be canceled free of charge 444-21 days prior to arrival. Further 10% of the rooms can be canceled free of charge 20-10 days prior to arrival. 1 further room can be canceled without penalty 4-9 days prior to arrival, for all cancelled rooms exceeding this amount 100% cancellation fee is payable. 0-3 days prior to arrival: no cancellation is tolerated without cancellation fee (100%). 30 % prepayment (but min. 500 EUR) of the total costs is to be paid 45 days prior to arrival. Total costs (100 %) is to be paid either by banktransfer/cc in advance, of cash/cc at arrival. Feel Good, Safe and Satisfied in a clean and quiet, organised artistic environment, in the centre of Budapest. Our hostel is located in the Budapest party area, surrounded by shops, restaurants, clubs, ruin bars and sights. The newly renovated (March, 2016) Friends Hostel & Apartments with its exclusive service and decoration welcomes You all, whether you are a solo or business traveller, a couple, a family, or a small group of friends. 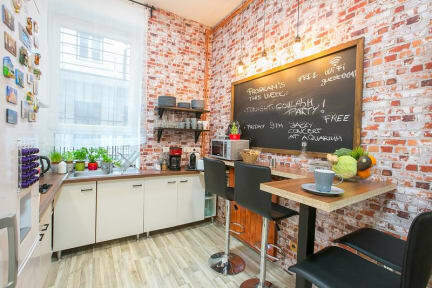 Friends is clean and quiet design hostel with several accommodation options and artistic design in the centre of Budapest. Everything is reachable on foot. FRIENDS HOSTEL offers 20+ rooms and 10+ apartments for total 80+ persons. We have mainly private rooms for 1 to 5 people with shared facilities, but also ensuite rooms with own bathroom, plus 2 dormitories for only girls (6-8 pers). Our apartments: We also have apartments on the same floor as the hostel itself (next door), and separate apartments in neighbouring buildings in our area. The apartments can accommodate 2 to 10 persons, each of them is with bathroom and kitchen, most of them with living room and tv, wifi ect. We only offer NON-SMOOKING rooms. We have a huge TV with sat channels and X-Box360 to make your stay as fun as possible. We help you plan your best program, activity or party during your stay in Budapest. Unlike in the huge hostels we intend to take care of every single traveller in case of any questions from program planning to any local assistance. * Check in from 2.00pm. check out by 10.00am. * X-box360 – Fifa, Call of duty ect. * Bookable programs, tours and activities as: Caving tours, Free walking tours, City Tours, Bicycle tours, Pub tours, Thermal baths, concerts, opera, boat etc. * Luggage storage: free on check in day only before checking in, After checking out, you may leave your luggage in our luggage room. until 9 pm. Luggage storage fee is 2€ / booking.